Welcome to Hawaii, the Aloha state. Hawaii is comprised of a chain of 132 islands. We usually think of the eight main islands when we think of Hawaii. This is not surprising as the other 124 islands only total about 3 square miles in land area. Hawaii is home of the world's most active volcano, the crater of Kilauea on Mauna Loa. Sandy beaches, towering volcanoes, and lush valleys lure thousands of tourists each year to this tropical paradise. Hawaii is the most ethnically and racially diverse state of any state in the union, a mix that includes Caucasians, Americans of Japanese descent, and Polynesians, among others. Native Hawaiians have held on to many of their customs and traditions despite the influx of non-natives over the years. Hawaii is the only state that has an official native language. Statehood had been proposed many times throughout Hawaii's history, but it was not until 1959 that Hawaii became the 50th state of the United States. Though Captain James Cook called the islands that he discovered in 1778 the Sandwich islands, this honor to the Earl of Sandwich would be short-lived. King Kamehameha I united the islands under his rule by 1819 as the Kingdom of Hawaii. A couple of theories exist on the origin of the name Hawaii. One theory has it that the name comes from a combination of the words "Hawa" and "ii" and means a small or new homeland; "Hawa" meaning a traditional homeland and "ii" meaning small and raging. 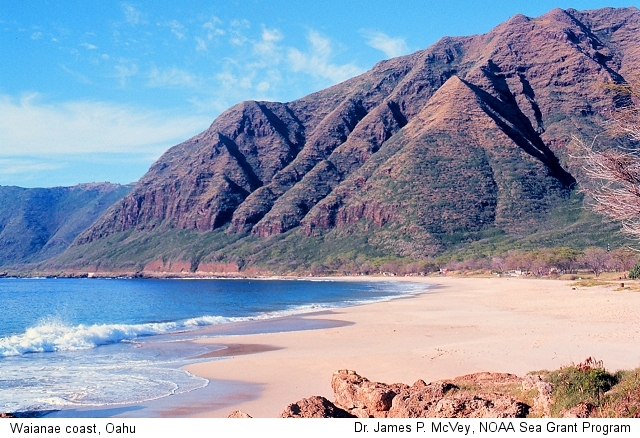 The other theory is that the name comes from the traditional discoverer of the islands, Hawaii Loa. This official "Popular Name" was designated in 1959 by the Legislature of the State. This was adopted in the same year in which Hawaii became a state. Hawaii has also been referred to as "The Pineapple State" because of the pineapple industry and its impact on the state's economy. Anyone who has ever visited a secluded cove on one of the Hawaiian islands will understand why Hawaii is sometimes called the "Paradise of the Pacific." The natural beauty of the islands is well known. 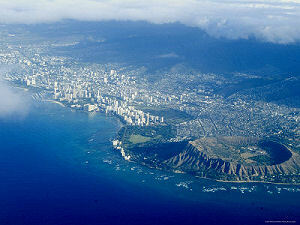 The last state to enter the union, Hawaii is sometimes referred to as "The Youngest State." People who live in Hawaii or who come from Hawaii are not all referred to as Hawaiians. "From now on, Hawaiians will be used only to describe members of the ethnic group indigenous to the Hawaiian Islands. 'Hawaii resident' or 'islander' describes anyone who lives in the state." People who are native to Hawaii are called Hawaiians. People who live in Hawaii but are not native Hawaiians, even if born in the state, are referred to as Hawaii residents or islanders. The fifth and final quarter-dollar coin released in 2008 honors the State of Hawaii, and is the 50th and last coin in the United States Mint's popular 50 State Quarters® Program. Hawaii, spelled "Hawai'i" in the Hawaiian language, is nicknamed "The Aloha State." It became the 50th state admitted to the Union on August 21, 1959. The release of this quarter signals the end of the ten-year 50 State Quarters Program. The reverse of Hawaii’s quarter features Hawaiian monarch King Kamehameha I stretching his hand toward the eight major Hawaiian Islands. Inscriptions are the state motto "UA MAU KE EA O KA ĀINA I KA PONO," ("The life of the land is perpetuated in righteousness"), "Hawaii" and "1959." The 36-member Hawaii Commemorative Quarter Advisory Commission, composed of leaders and students from around the State, invited citizens to submit themes for the coin's design. From the 400 ideas it received, the Commission developed five narratives to send to the United States Mint for consideration. These narratives were developed into design candidates by the United States Mint's Sculptor-Engravers and artists in the United States Mint's Artistic Infusion Program. The designs were then proposed to the State, where an online poll was conducted to determine the citizens' preference. More than 26,000 votes were cast. On April 23, 2007, Governor Linda Lingle announced her selection of the "Hawaii, the Island State" design featuring King Kamehameha I, which was the recommendation of the Commission and also the winning design of the online poll. The Department of the Treasury approved the design on May 25, 2007. Four other designs were considered, including "Hawaii - Diverse but Unified," an alternate design depicting the eight major Hawaiian Islands and King Kamehameha I; "Aloha Spirit," featuring a traditional female hula dancer; "Diamond Head," featuring the State's iconic landmark; and "Surfing - Hawaii's Gift to the World." Hawaii (From Sea to Shining Sea) , by P.J. Neri. 80 pages. Publisher: Scholastic Library Publishing (September 2008) Reading level: Grades 3-5. Presents information about Hawaii's people, geography, history, landmarks, natural resources, government, state capitol, towns and cities, and more. Hawaii (World Almanac Library of the States) , by Robin S. Doak. 48 pages. Gareth Stevens Publishing (January 2003) Reading level: Grades 4-6. Filled with the most up-to-date information, including the latest Census results. Full-color photos bring to life the story of Hawaii. In addition to an in-depth factual profile of Hawaii in the form of a state Almanac, this book offers fascinating and lively discussions of the state's history, people, geography, government, economy, culture, and lifestyles. A section on Notable People, a calendar of events, and enough primary source documents, time lines, maps, and other tools to make this unquestionably the best young adult reference material on the USA available anywhere. A Concise History of the Hawaiian Islands , by Dr. Phil Barnes. 86 pages. Petroglyph Press, Ltd.; 1st edition (November 1, 1999) A Concise History of the Hawaiian Islands covers the major events and personalities in Hawaiian history from the first human landfall through the sovereignty movement of the late 1990s. The history comes to life through illustrations and interesting anecdotes. By investing a couple of hours the casual reader can greatly increase the depth of their understanding of the events that have shaped and continue to shape these magical islands. Hawaii's Story by Hawaii's Queen , by Lydia Liliuokalani. 424 pages. Mutual Publishing (October 1991) The Hawaiian kingdom's last monarch wrote her biography in 1897, the year before the annexation of the Hawaiian Islands by the United States. Her story covers six decades of island history told from the viewpoint of a major historical figure. Possibly the most important work in Hawaiian literature, Hawai'i's Story is a poignant plea from Hawaii's queen to restore her people's kingdom. Introduction by Glen Grant.